Almost as one entity, 22 women lifted their arms in the air and screamed for joy. 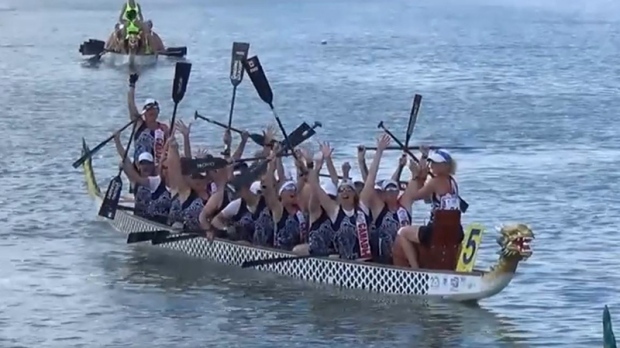 It was the instant the Gorging Dragons women’s Senior B team realized they had won gold in the 500-metre race at the World Club Crew Championships in Hungary. Team member Catherine “Cat” Black said it took a moment before they knew they had won because they can’t look around at the other dragon boats when paddling. They sat on the water and waited. Then waited some more. “We are trying to be quiet, and then we look over and our head coach is up there and he looks at us and makes the number one sign and we just went insane, it was just such an emotional experience,” she said. That gold medal was just part of the Gorging Dragons’ success. Altogether, men and women in various seniors’ categories won nine medals in 12 races. “It’s everyday people that are just achieving absolutely outstanding results,” said Tom Arnold, the team’s head coach. The Gorging Dragons have teams in a number of categories, but it was the seniors teams that shone. The paddlers ranged in age from their 50s to 60s and even into their 70s. Some, like 54-year-old Black, became athletes late in life, and were shocked to find themselves winning medals for Canada on the world stage. Black said everyone on the team pushed each other to be better than they ever knew they could be. “They were like ‘You will, you are going to get it. You can do it. You will do it. It will happen.’ Everything is just driven that way. When you are in such a positive environment you can only just keep moving forward. It’s just such a unique family,” she said. 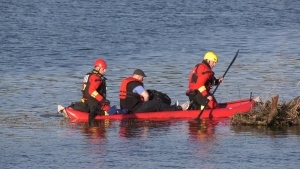 Most of the paddlers take part in three in-boat practices in Victoria per week, plus they have fitness programs they work on the rest of the week. But members are from all over the island, some coming to practice every Sunday from as far as Comox, Campbell River and Port McNeill. The Vancouver Island team was competing against teams from major world cities. “The population bases they have to draw from are so much bigger. So to go and to win 9 medals and to be very close on a couple more was absolutely outstanding,” said Arnold. Black said for her and her teammates, it was about believing in themselves and each other.